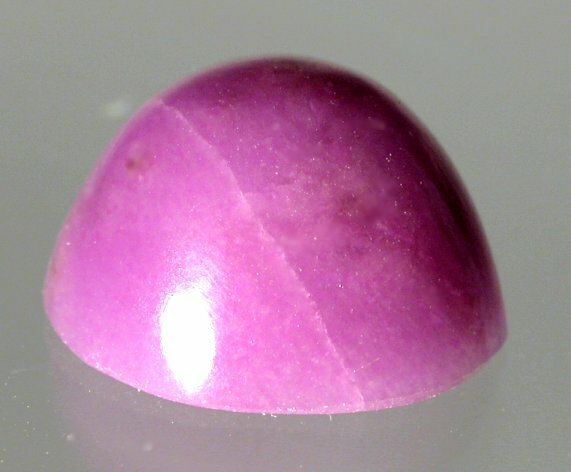 Sugilite is found in Japan, Canada and most importantly, South Africa. 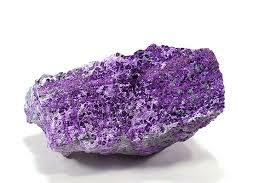 Sugilite helps to increase physical stamina and endurance. Use this stone to support treatment for iron deficiency and well as breathing difficulties or other lung related health challenges. It is also beneficial for those with anaemia, asthma and allergies. This stone has a harmonising effect on the nerves and brain function. It assists with epilepsy, dyslexia, autism and Asperger's syndrome. 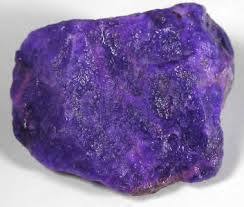 Sugilite will reduce and encourage the recovery from infection and viruses. This stone enhances the function of the pineal and pituitary glands. Sugilite encourages balance to food related addictions and compulsions, such as excessive alcohol. It assists in controlling gambling and out of control spending. 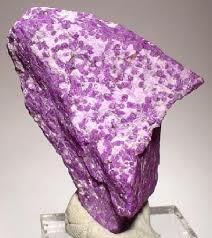 The lighter coloured sugilite purifies the lymph glands and blood. Sugilite improves the ability to face up to unpleasant things. It dissolves tension in the soul, alleviates sorrow and grief and helps with fear, paranoia and schizophrenia. This is a stone for the heart and resolves inner hurt. It is helpful for adopted children who feel rejected by their birth parents. Sugilite is excellent for children who find socialising hard. This is a stone for those who are involved in the care of vulnerable people as it offers compassion to the carer. This is a powerful love stone that avoids sentimentality in relationships while encouraging commitment in good times and bad. 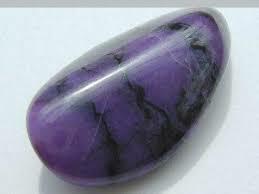 Wear, sugilite to attract kindred spirits and encourage a love of life and a belief in the inherent goodness of people. Sugilite helps you cultivate tools to love and be loved without neediness on the part of either person. Use this stone to develop a true understanding of detachment, which can help you develop healthy relationships once you realise reality's impermanent nature. This stone will assist you in transforming disturbing emotions or ignorant beliefs, especially as they relate to your relationship with others. Sugilite helps you to overcome hopelessness, overwhelming feelings of having no options in your life. It reminds you that you can achieve anything you can dream and lends you the strength and courage to manifest those dreams. It is ideal for those people who tend to fall into negative thinking or who lack confidence in their abilities. Sugilite is useful in counteracting nightmares, insomnia and other sleep imbalance. it offers you peace of mind and can help in calming your nerves and releasing worries. It helps forgiveness and eliminates hostility. Sugilite encourages loving communication in a one on one situation but particularly in a group situation. 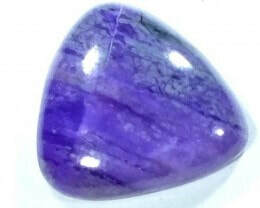 Sugilite encourages positive thoughts, it is ideal to do affirmations. Sugilite allows you to deal with and overcome conflicts without entering compromise. It helps find solutions that are based on agreement and don't put the other party at a disadvantage. Sugilite helps you let go of the past and move forward in a positive way. 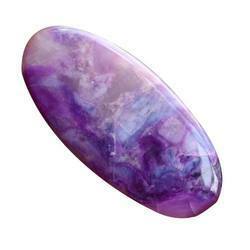 This stone deflects negative thoughts projected from others and from yourself. The transmutational power of this stone, transforms negative belief systems, gently guiding you toward a more beneficial belief systems. Sugilite's energy calms relentless inner chatter and invites peace and a calm mind. Sugilite is a powerful stone for opening the third eye and etheric chakras. It activates inner vision and opens you to your innermost motivations thoughts and belief. The bright, vibrant colours of sugilite opens the upper chakras to allow you to connect with your dreams. The darker coloured stones help you in grounding those dreams into reality and maintaining your fortitude in pursuing them. ​Sugilite helps cancer suffers, as it will help with acceptance of the situation and guide you to overcome despair, while drawing off negative energy and give you support while channelling healing energies to the mind, body and spirit. Sugilite helps you maintain you own point of view. It encourages you to live in accordance wiht your inner truth and not to allow yourself to be deflected from it, either through pressure or persuasion. This stone assists you when you wish to recall past lives, it keeps the balance between the everyday practicalities and the spirit world. Sugilite encourages personal transformation. Use it to enhance your meditation practices or assist you in contemplation. Sugilite helps you believe in life's possibilities. It helps you envision something other than what is currently being experienced, offering hope and optimism for a better future. 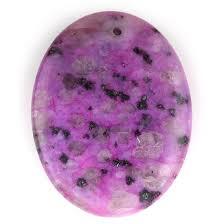 This stone can assist in repelling negativity and in filling your aura with high frequency light. Sugilite teaches you how to live honestly and truthfully and reminds the soul for the reasons that you are there. This stone helps you find the answers that everyone ask at some point in their lives. "Why am I here? ", "Who am I, really?". This stone will protect you from shock, trauma and disappointments. It helps highly sensitive people and light workers to adapt to the vibrations for the earth without becoming bogged down in minutiae. Sugilite is one of the love stones, bringing the purple ray energy to earth. It represents spiritual love and wisdom. 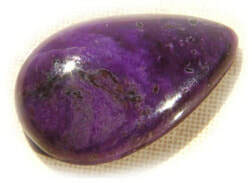 Sugilite inspires spiritual awareness and promotes your channelling ability.